Artist Olek is known for her colorful yarn-bombed art installations. She's covered a train, a van, and a room with colorful yarn designs. 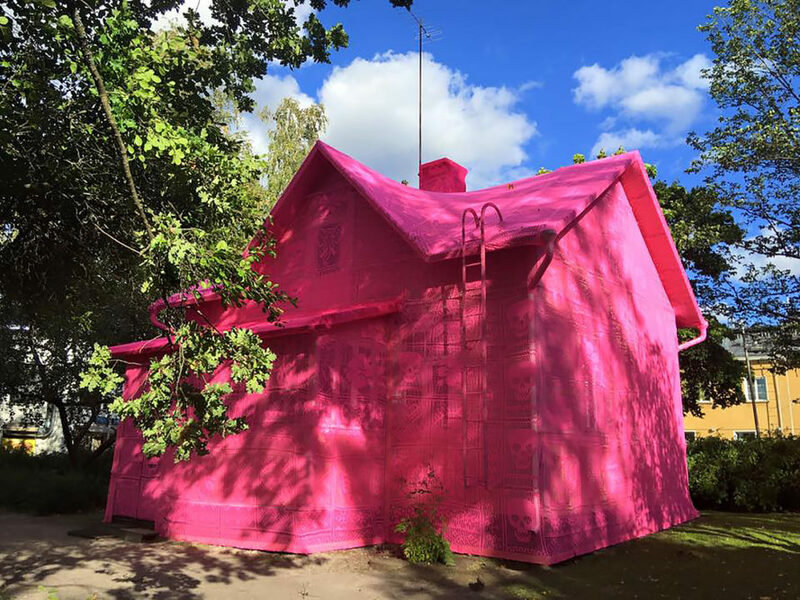 Now she's blanketed two homes - one in Sweden, one in Finland - in bright pink yarn as a symbol of hope. 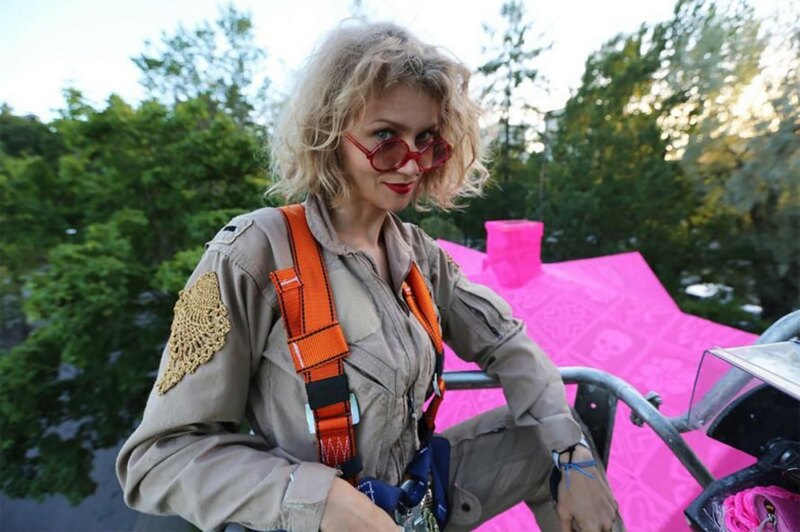 Olek traveled to Avesta, Sweden to install art at a museum, and during conversations with Ukrainian and Syrian refugees who helped with her art, she decided to “blow up my crocheted house to illustrate the current unfortunate situation worldwide” where many have had to flee their homes. According to Olek, more than 21 million people lost homes to conflict or war in 2015. “Our pink house is about the journey, not just about the artwork itself. It’s about us coming together as a community. It’s about helping each other. In the small Swedish community of Avesta we proved that we are stronger together, that we can make anything happen together. People from all walks of life came together to make this project possible,” said Olek. She blanketed a home in Avesta and a home in Kerava, Finland with beautiful pink crocheted yarn. The Kerava home is over 100 years old, and its past inhabitants once had to flee as bombs fell in the yard during a war. While they were able to return, Olek wanted to show through the two yarn-bombed houses that although many people currently don’t have a permanent place to live, “everybody should have a home.” Each inch of the Kerava house is covered with pretty pink designs, from the chimney all the way down to the floorboards. Many women helped Olek with the process. From top to bottom, the houses are covered in beautiful pink yarn. She blanketed a home in Avesta and a home in Kerava, Finland with beautiful pink crocheted yarn. The Kerava home is over 100 years old, and its past inhabitants once had to flee as bombs fell in the yard during a war. While they were able to return, Olek wanted to show through the two yarn-bombed houses that although many people currently don't have a permanent place to live, "everybody should have a home." Each inch of the Kerava house is covered with pretty pink designs, from the chimney all the way down to the floorboards. Many women helped Olek with the process. In an Instagram post, Olek said, "I wanted to create a positive ending for them as a symbol of a brighter future for all people, especially the ones who have been displaced against their own wills. Women have the ability to recreate themselves. No matter how low life might bring us, we can get back on our feet and start anew. We can show everybody that women can build houses, women can make homes...our pink house is a symbol of a bright future filled with hope." Olek traveled to Avesta, Sweden to install art at a museum, and during conversations with Ukrainian and Syrian refugees who helped with her art, she decided to "blow up my crocheted house to illustrate the current unfortunate situation worldwide" where many have had to flee their homes. According to Olek, more than 21 million people lost homes to conflict or war in 2015. "Our pink house is about the journey, not just about the artwork itself. It’s about us coming together as a community. It’s about helping each other. In the small Swedish community of Avesta we proved that we are stronger together, that we can make anything happen together. People from all walks of life came together to make this project possible," said Olek. Many women helped Olek with the process. The pink houses are meant to be a symbol of hope.